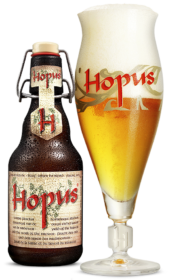 Hopus is Blonde with copper reflections, topped with a generous head, Hopus derives from a secret batch brewed for the marriage of Paul Lefebvre., it has an alcohol content of 8.3%. Blonde with copper reflections, topped with a generous head, Hopus derives from a secret batch brewed for the marriage of Paul Lefebvre. It has a unique and original nose, a blend ofvegetal, citrus and fruit notes. The attack is bold, with an intense bitterness accompanied by a plethora of hopped notes. On the palate, the fruity top-fermented aromas and the malted flavours perfectly balance the initial taste without masking it. The bitter aftertaste is persistent but not disturbing, powerful but not overwhelming, elegant but not opulent…in short, the perfect preparation for the next mouthful. Drink very cold as an aperitif with crisps and pickles, as an accompaniment to a spicy dish or as an after-dinner digestive.